Reflecting on an internship in Public Engagement | What would George think? 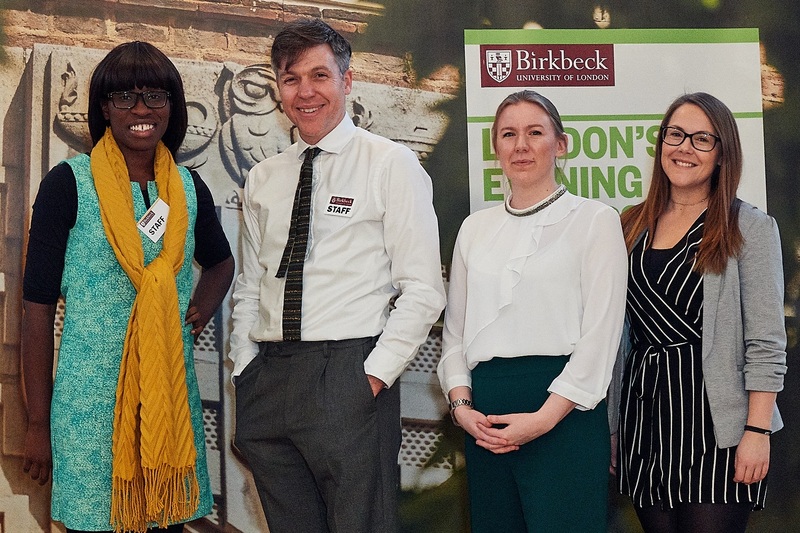 Back in October 2018, I joined Birkbeck as their second Public Engagement Intern. I have spent all my adult life working in public engagement, usually in relation to science, in some form or other, but this was my first role working embedded within a Public Engagement team in a university. As such, this post at Birkbeck offered me the excellent opportunity to expand my knowledge of public engagement with research within the higher education sector and to work with a group of people that I like and whose work I greatly respect. Birkbeck has a strong tradition of socially engaged research and a commitment to its historical mission to connect with a wide and diverse range of people outside of academia. This mission is precisely why this was a university I wanted to work for; very few places have such a sense of social responsibility and a desire for equity of knowledge at their core. My role was centred on the Public Engagement Awards. This project was now in its second year, having been initially developed by the team with last year’s public engagement intern, Rhea Sookdeosingh, who has since moved on to another role within the college as a Public Engagement & Events Coordinator in the Department of History. Rhea left the project in a very good state and I hoped to build upon her legacy. The awards exist for many reasons. They seek to acknowledge and celebrate the ground breaking public engagement projects being conducted by researchers here. They allow us to take the public engagement pulse of the college and take a snap-shot of how the research conducted at Birkbeck both affects and is affected by the outside world. The ceremony itself acts as a fun means of putting some of our champions of public engagement all in the same room so that they have the opportunity to reflect on their own and each other’s processes, learn new approaches and possibly meet new friends and potential future collaborators for the first time. It felt a real privilege to be behind the scenes and shape the awards so that they might act as an incentive to take public engagement seriously and help improve how people here interact with the wider public. By redrafting our application process to reflect what best practice looks like, changing the prizes we award with the aim of upskilling our researchers or furthering their capacities in other ways and working on the visuals used throughout to better show off engagement achievements, we have pushed for a more holistic approach that benefits not only our researchers but those they work with. I hope the awards continue to flourish. The scheme culminated in the Awards Ceremony at Mary Ward House where, over wine and nibbles, the shortlisted researchers swapped stories and revelled in their success. You can learn more about the winning projects and the night as a whole here. By far my favourite aspect of the scheme was meeting the researchers along the way. I was continually surprised and impressed by their raw enthusiasm and desire to make the world that little bit better through their work. It was terrific to learn of what they were doing and help their future projects prepare before they take flight. Understanding what they were doing now was the first step to suggesting how they might scale up their efforts and what other avenues might be worth pursuing. It should come as no surprise that our department, which helps researchers and our research culture grow by building mutually beneficial and respectful relationships, also benefit by building such relationships ourselves with as many people as we could. I feel greatly indebted to the people of External Relations, Development and Alumni and the Research Office who have not only provided solid support and expertise throughout these last six months, but made my time here such a joy. In particular I owe thanks to Mary-Clare Hallsworth and Katy Glazer, as the Public Engagement Team, who aided and abetted me all the way. They have changed how I think in many ways and helped me grow in confidence with regards what my opinions and expertise are worth. I will continue to make my own engagement projects and help others with theirs. I am, as ever, keen to collaborate. Please get in touch. Category: Professional Services Author: Louisa.